Spending a lot of time watching YouTube videos? Check out the Turn Off the Lights extension that will make your viewing experience more pleasant. Turn Off the Lights is an open source browser extension that is designed, and engineered that it works on all websites. So when you click on the gray lamp button. It dims the web page and highlight the YouTube video player or the HTML5 player. Everything is designed based on the feedback from our users and with a simplify for the user to use this browser extension. It’s All-in-One Extensions for YouTube. Because in the options page you can enable also the YouTube AutoHD, AutoWide, Atmosphere Lighting (glow around the video player) and many more. And the best of all it doesn’t change the web page when layout or mess up the design on that website. The lamp button to dims the web page work only when you click on the gray icon. It works for all used browser such as Google Chrome, Opera, Safari, Firefox, Microsoft Edge, Maxthon and Yandex. You can download the extension on the official Turn Off the Lights homepage. When you open this page, click then on the big blue download button. 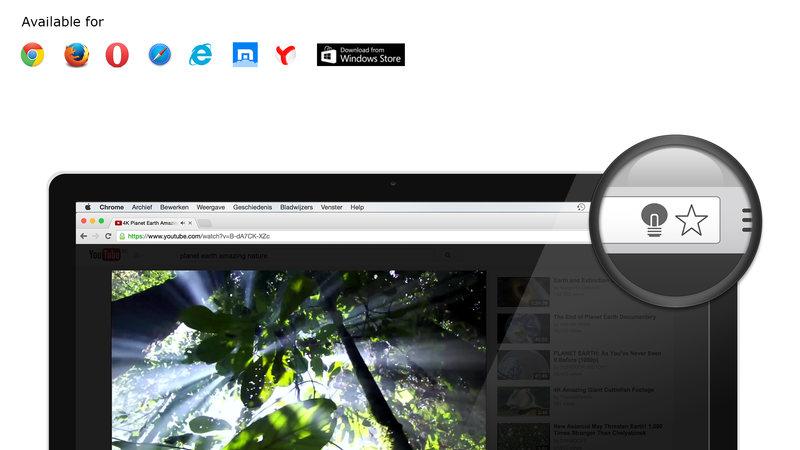 To download the extension direct in your web browser.